Members of our product design group grew up in the softball industry, from playing the sport to coaching it, all the way to designing and manufacturing some of the first pitching machines. Through years of intimate personal experience as well as significant relationships developed through the years with coaches at all levels, our folks were not only keenly aware of the needs of the coach and player but also understood both the strengths and weaknesses of each pitching machine design that had been manufactured over the years. Analyzing the existing softball pitching machines in 2003 we found that the basic design had not changed for many year. There had always been little attention to safety, portability or ease of operation and the majority of the machines were very awkward and difficult to operate, especially for women. The most popular unit at the time was a snubbing-action inefficient one-wheel machine that experienced excessive recoil, high ball wear, but most importantly, could not duplicate the riser and other breaking pitches that are standards of the game. Our design began by identifying wheels as the most efficient ball throwing mechanism. Wheels can throw breaking pitches, provide accuracy, and deliver the much-needed speed. The true uniqueness to our machine is the use of a third wheel. The location of the three wheels visually opens the ball chute, allowing the hitter to see the ball through acceleration and release, providing complete vision and timing. By simply changing wheel speed, any breaking pitch could be instantly dialed in as the third wheel eliminated the need to pivot the throwing head when changing pitches. Accuracy and ball control were also improved due to the increased amount of ball surface being captured. Additional benefits of the third wheel were a reduction of throwing wheel and ball wear. Other important characteristics of the design were to incorporate safety features that kept the operator protected from moving parts. Ease of vertical and horizontal controls were also key for pitch location and fungo work. In addition, portability was a requirement, providing mobility on and off the field and for storage. Our three-wheel machine delivers every softball breaking pitch, from the raiser to right and left-handed drops. 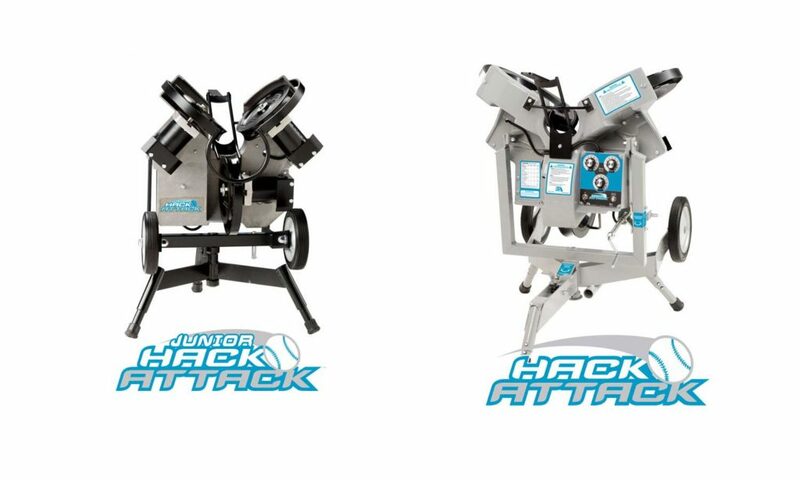 With the key features of portability, safety, vision and timing that are inherent in the design, the Softball Hack Attack quickly caught the attention of leading college and high school programs across the nation. For younger players and specific drills at all levels of competition, the Hack Attack was quickly followed by the Junior Hack Attack in 2004. It is equal in quality and design and used to develop dedicated players into the all-star they want to be. The Junior is perfect for use at home in backyard cages, youth leagues games and travel ball. The first arm machines that were used were unguarded, leading to some very tragic accidents. Arm machines then needed to be heavily guarded, limiting the vision advantage. Due to the enormous recoil generated by the arm, the machines also had to be bolted to concrete pads, making them stationery and not available for field or fungo work. Even today arm machines remain bulky and massive. The strengths of this design were some level of vision and timing. The weaknesses were that it was limited to only fastballs, completely immobile and still carried a concern for safety. The innovators of the wheel machines saw the ability to throw curve balls as the ultimate feature in pitching machines. While the initial wheel machines threw curve balls, they ignored the need for portability and for guarding throwing wheels. Slowly improvements were made to introduce some portability and fungo capabilities but essentially the basic design has stayed the same. The strength of these units was certainly the curve ball, although they required awkward and time-consuming adjustments in order to change the type of pitch. One of the major deficiencies was the lack of the all important vision and timing feature. This meant that wheel driven pitching machines at the higher levels of play were frequently considered just pre- season or off-season tools, avoided during the season because it was felt they affected a hitter’s sense of timing. Weight 145 lbs. 75 lbs.